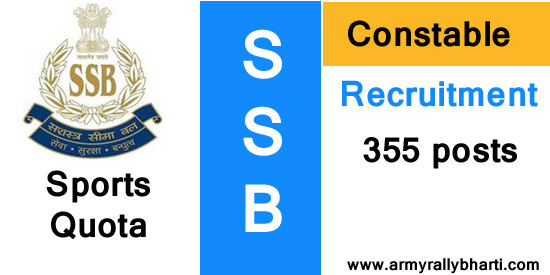 Sports quota applications are invited fromn Indian male and female candidates for the post of Constable (General Duty) for the year 2017 - 2018 in SSB Sashastra Seema Bal. These posts are temporary but likely to be continued. Vacancies :- Total 355 posts are vacant in various disciplines. Age limit :- 18 to 23 years for General Duty posts and age relaxation will be as per government rules. Education Qualification :- Matriculation or 10th pass from recognized board or university. by Indian Olympic Association, Sports Federation of (concerned sport) for last 01 (One) year i.e. in between 01.04.2016 to 31.03.2017. Candidates who want to apply SSB sports quots bharti must apply before 30 days. the Assistant Director (Sports) Force Hqr.